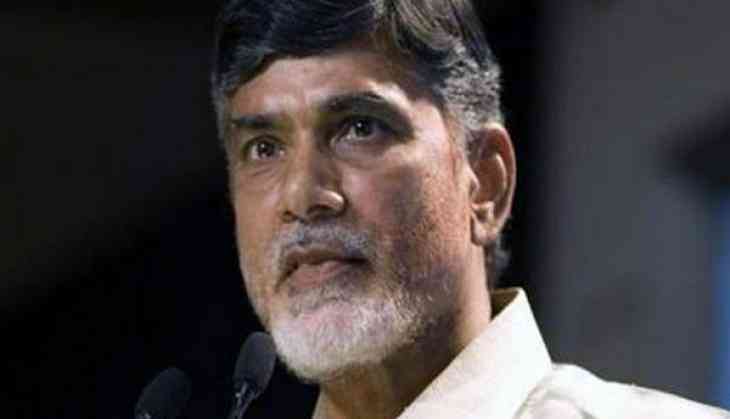 The ruling Telugu Desam Party in Andhra Pradesh Saturday released its manifesto for the general elections promising doles to the tune of Rs. 2 lakh to each family every year, with the monetary benefits starting from womb to tomb. Releasing his party manifesto, TDP president and Chief Minister N Chandrababu Naidu said while Congress chief Rahul Gandhi promised Rs. 72,000 per annum to each poor family, his government, if voted back to power, would be giving out Rs. 2 lakh to each family every year. "Nobody can match us in extending such largesse even inimagination," he said. The TDP promised to continue the Centre's PM Kisan Samman scheme with a matching grant from the state, giving a benefit of up to Rs. 15,000 to each farmer per annum. The principal opposition YSR Congress party also released its manifesto, hours ahead of the TDP, matching the largesse in equal measure, if not more. The Assembly and Lok Sabha elections are being held simultaneously in Andhra Pradesh which goes to the polls in the first phase on April 11. While the TDPs promises include raising the limits of various existing schemes for different sections, the YSRC party added several new components to the Nava Ratnalu it announced on the eve of its president Y S Jaganmohan Reddys ''paada yatra'' in November 2017. Officials estimated that the cash-starved state government will require at least Rs. 1.5 lakh crore to Rs. 2 lakh crore to fulfill the promises of either party. With the two parties promising 30-45 lakh free houses for different sections, besides waiver of existing loans on old houses, that bill alone is expected to cross over Rs. 40,000 crore. Neither the TDP nor YSRC announced a farm loan waiver but promised several benefits to farmers in varied measures. The YSRC, on the other hand, promised to introduce the YSR Rythu Bharosa scheme that will give annual benefits from Rs. 12,500 to Rs. one lakh to each farmer. Tenant farmers would be given Rs. 12,500, according to Jagan Mohan Reddy. The highlight of YSRC's promises is a health insurance scheme Aarogya Sri, first introduced by former Chief Minister, the late Y S Rajasekhara Reddy, without any cap to ensure universal health coverage. The YSRC also announced a stipend of Rs. 60,000 to junior lawyers, a first-of-its-kind incentive. Besides, a Rs. 100 crore Lawyer Welfare Fund would also be created. While the YSRC chief promised to fill all 2.3 lakh existing vacant jobs in the state government, the Chief Minister merely said all vacancies would be filled, without specifying the number. Both, however, promised to take up recruitment drive every year to fill future vacancies in the government. Mr Naidu promised to continue the Pasupu-Kumkuma scheme under which Rs. 10,000 would be given to each member of women self-help groups (SHGs). The YSRC promised Rs. 50,000 per annum to SHG women and also interest-free loans. The TDP promised free higher education and a Rs. 25 lakh grant for overseas education while the YSRC promised total fee reimbursement and also an annual Rs. 20,000 per student to cover food and accommodation expenses. Every woman would be given Rs. 15,000 a year for sending her children to school. The opposition party also promised liquor prohibition, making it available only in five-star hotels. A Rs. 3,000 crore price stabilization fund for the farm sector, Rs. 4,000 crore Natural Calamity Fund and Rs. 75,000 crore BC Welfare Fund are the other major promises of the YSRC. The TDP has also come forward to set up a price stabilisation fund with a corpus of Rs. 5,000 crore. Mr Naidu announced a "five-point vision" for AP development listing interlinking of rivers, construction of capital Amaravati into a world-class city, development of a 974-km long Beach Road with interlink to National Highways and airports, industrial development through 175 MSME Parks and use of pollution-free energy consumption as the keypriorities.